The Chilcotin River is a very cold and fast moving river. Please keep children and pets away from the river. Swimming is not recommended. People can view shallow caves in Bull Canyon Mountain on the Chilcotin River Interpretive Trail. Bull Canyon Park is often used as a base to explore the Chilco. The gates at Bull Canyon are locked during the off-season, from September 16th to May 14th. 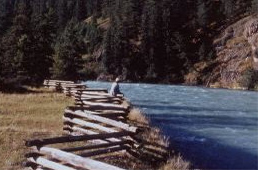 Bull Canyon is the only provincial campsite along Highway 20 between Williams Lake and Tweedsmuir Provincial Park. There are several Forest Service campgrounds and two private campgrounds on or near this section of Highway 20. Six kilometres west of the community of Alexis Creek, off Highway 20. The nearest communities, towns and cities are Alexis Creek, Redstone, Hanceville and Williams Lake. History: Bull Canyon was established as a UREP (Use Recreation for the Enjoyment of the Public) reserve in 1955 for the use, recreation and enjoyment of the public. The Forest Service operated a fire suppression camp in the summer months, just east of the present campground, from 1955 until the 1980s. The campground was developed in the 1970s and reconstructed in 1992. Bull Canyon was designated as a provincial park in 1993. Cultural Heritage: Archaeological sites exist throughout the park and are protected under the Heritage Conservation Act. Please do not disturb these sites. There is a Chilcotin River Interpretive Trail at the park, which is 2 km (return) in length and was designed and developed by the students of Alexis Creek Elementary School. For your own safety and the preservation of the park, obey posted signs and keep to designated trails. Shortcutting trails destroys plant life and soil structure. A hand pump well is available in the park. It is located at the entrance of the park in the day-use area. This park only has pit toilets. They are located in the day-use area and throughout the campground. This park offers vehicle accessible campsites on a first-come, first-served basis – campsite reservations are not accepted. There are 20 small to medium sites in total, 2 of which are double sites and 1 a pull through site. There are also 4 tent sites. Sites are open, but still private, through to shady. The closest store is 6 km away in Alexis Creek. If staff are not available when you arrive at the campground, choose your site and pay later. Staff will be at the campground at least once a day during the camping season. There is one toilet located at the entrance of the park that is wheelchair accessible.